LeafyVPN offers VPN services in the market with a publicity of having over 100 servers, offering secure and anonymous services. With a standard range of devices supported by this VPN provider, which offers every feature that a VPN user would require to use the service along with some other features. The features of this VPN service are discussed in the review as under. There is a single package offered by this VPN provider, which is offered with different price tags for different subscription terms, offering a discount over longer terms. The monthly subscription plan is available at a cost of $9, which is a fair price for this service. The plan for a 3-months subscription is offered with a price tag of $24, while the semiannual and annual packs are available at a cost of $39 and $69 respectively. The VPN provider offers a free trial service with all its packages that is available in the form of a 3 days money back guarantee offer. Thus, there is no free trial available, but a money back guarantee that can be used for a total refund, if you don’t like their service within 3 days of subscription. For the security of the data transferred by the users across its servers, the company offers a use of different protocols like OpenVPN, L2TP & PPTP, where OpenVPN option is unavailable for DD-WRT routers and iOS devices. The data over these protocols is secured with an encryption of 256-bit or 128-bit, based on the maximum supported strength. For the privacy of user’s personal information, the user logs are stored for activities in last 3 days only, which assures of user privacy. With tests for this VPN service conducted on speedtest.net, the results observed were very sluggish and thus, pointed towards an average performance of this service. However, this VPN service can be accessed on desktop devices running on Linux, Mac and Windows operating systems. Among the mobile devices, iOS and Android operating systems are supported, while other devices compatible with this service include DD-WRT routers. 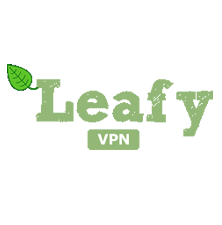 LeafyVPN service is supported by a few support options for their customers, which contain a ‘contact us’ link that can be used to raise a support ticket and is available for registered users only. There is a FAQ section available that reveals the response time for the submitted query to be 12 hours, while a test query submitted was replied within a satisfying time of 4 hours. The customer area provided for the users offers basic features and has an extensive functionality. The connectivity to all the servers is excellent, but it lacks on the performance side. However, a limited number of support options and other matters could pose a little confusion to the non technical users using this service. The offer of a money back guarantee, while boasting of a free trial is a drawback, which is non applicable on issues related to speed.